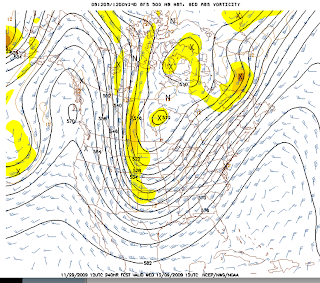 During the last decade meteorology has made tremendous progress in forecasting for periods out to 72 hours. However, for periods beyond three days, accuracy falls off considerably. Here is an example of how you can get tremendously different forecasts ten days into the future. If this forecast is correct, it will be extremely cold in the Rockies and Plains with snow, possibly heavy, in the Mississippi Valley. The blue lines on this map depict the same values as the black lines on the above chart. 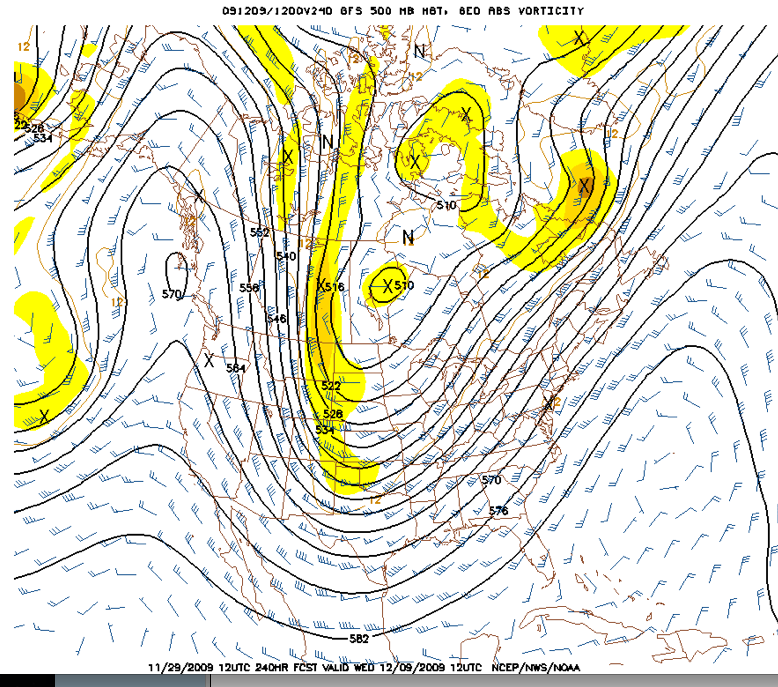 You do not have to be a meteorologist to see the pattern is completely different. 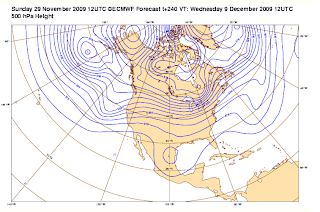 No cold wave with fair weather over the Plains and Upper Midwest. There are two things I would like you to take away from this. The first is that ten day forecasting is, at best, a roll of the dice. We have no consistent skill. The second is that if we cannot make consistently good forecasts ten days into the future, how is it we think we can make ten year forecasts of climate change? The answer: We can't. One of the best movies I have seen in years. Kathleen and my brother and sister-in-law agreed. Don't miss it! Now, Phony Temperatures in New Zealand? I am going to take a few days off from blogging. If you need the weather for shopping or traveling, I leave you in good hands. "This should be considered not merely a scientific scandal but an enormous journalistic scandal"
Here is a great explanation of Climategate for non-scientists. I agree with the conclusion. This scandal, as big as it is, does not pertain to the science regarding CO2 in the atmosphere. While I disagree in important ways with the IPCC in that regard (I believe their estimates of the rate of warming associated with CO2 are overstated by a factor of 3 or 4), it is important to separate what is, and is not, touched by Climategate. The people implicated in this scandal were involved in reconstructing past climate conditions, specifically The Hockey Stick which played a part in Al Gore's movie, "An Inconvenient Truth." There is more coverage of Climategate at: AccuWeather Global Warming Blog. Homer Simpson comments on Climategate. 'The two MMs have been after the CRU station data for years. If they ever hear there is a Freedom of Information Act now in the U.K., I think I'll delete the file rather than send to anyone. . . . We also have a data protection act, which I will hide behind." "So apparently wrote Phil Jones, director of the University of East Anglia's Climate Research Unit (CRU) and one of the world's leading climate scientists, in a 2005 email to "Mike." Judging by the email thread, this refers to Michael Mann, director of the Pennsylvania State University's Earth System Science Center. We found this nugget among the more than 3,000 emails and documents released last week after CRU's servers were hacked and messages among some of the world's most influential climatologists were published on the Internet..."
"Yet even a partial review of the emails is highly illuminating. In them, scientists appear to urge each other to present a "unified" view on the theory of man-made climate change while discussing the importance of the "common cause"; to advise each other on how to smooth over data so as not to compromise the favored hypothesis; to discuss ways to keep opposing views out of leading journals; and to give tips on how to "hide the decline" of temperature in certain inconvenient data..."
"Consider the following note that appears to have been sent by Mr. Jones to Mr. Mann in May 2008: "Mike, Can you delete any emails you may have had with Keith re AR4? Keith will do likewise. . . . Can you also email Gene and get him to do the same?" AR4 is shorthand for the U.N.'s Intergovernmental Panel of Climate Change's (IPCC) Fourth Assessment Report, presented in 2007 as the consensus view on how bad man-made climate change has supposedly become." "...we do now have hundreds of emails that give every appearance of testifying to concerted and coordinated efforts by leading climatologists to fit the data to their conclusions while attempting to silence and discredit their critics. In the department of inconvenient truths, this one surely deserves a closer look by the media, the U.S. Congress and other investigative bodies." As many know, we are in the runup to the international global warming conference in Copenhagen. The Wall Street Journal has been running a series of short articles by environmentalist Bjorn Lomborg that I believe put the issue of environmental priorities into perspective. If you are going to be in the Northeast for Thanksgiving this week, there is a pretty good chance of snow over parts of the region. 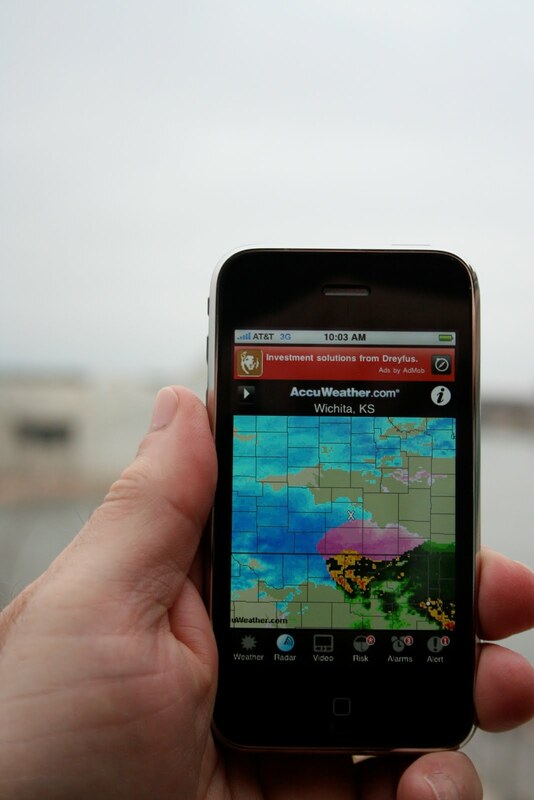 If you have an iPhone, make sure you have the AccuWeather iPhone app. It uses GPS to key the radar and forecasts to your exact location. And, its free. Unfortunately, there is no one “correct” answer. It depends on the student’s interest and career goals. First, some background. Meteorology seems to be a field where it is either feast or famine with regard to job openings. Throughout the ‘90’s there were more jobs than graduating students. Now, it is the opposite. There are jobs, but they are much less plentiful than they were ten years ago. I suspect that, in about five years, demand will pick up as the hiring bulge the National Weather Service experienced in the 1970’s (when I was graduating from college) becomes retirees. So, if your student is still in high school, there should be a reasonable number of jobs. However, it is always good to have a minor: Communications (essential for work in private sector meteorology), computer science, or business are appropriate complementary skills. Note: There is, to my knowledge, no such thing as a full time job in storm chasing. The traditional bachelor of science in meteorology requires several courses with calculus. This is the type of program at the University of Oklahoma, Florida State, Penn State, etc. I am not a math “natural” and managed to get through it, but it took work. That math is useful, but not necessary to be a good forecaster. If the student is confident he or she doesn’t want to have a research career or get an advanced degree in geoscience, much less math is required with the programs at Valparasio, South Alabama, DuPage, or Mississippi State (to give four examples). These are fine programs (South Alabama is especially good for private sector meteorology) but are not geared to research. Finally, there is some truth to the value of going to a school that experiences the type of weather the student is most interested in. If, for example, you want to be a hurricane forecaster, Florida State or South Alabama are good choices. I was hoping to avoid the global warming controversy until this blog is better established but events have overtaken my preferences. If you have been reading the media ( Fox News ) or internet today, you are probably aware that a number of emails and documents were hacked in Great Britian's Climate Research Unit (CRU). Because I am so busy working with my editor to get Warnings out in time, I have not looked over many of the documents. That said, there are clearly cases of pro-global warming scientists saying one thing in public ("warming is unequivocal") and something completely different in private ("where the heck is global warming?") during the same week, no less. I dislike the entire global warming controversy because, as I have stated on a number of occasions, it seems to have tainted atmospheric science. Unfortunately, the more we learn, the more true this seems to be. Here are some blogs if you wish to follow the controversy: Meteorologist Anthony Watts', Steve McIntyre's(which factors heavily in some of the hacked emails) and, on the other side of the issue, Real Climate. UPDATE: The best commentary (written for the non-scientist) I have seen is at Powerline. I agree with John's analysis. My suspicion that global warming has tainted atmospheric climate science, sadly, has proven to be true. The folks at WeatherBrains were nice enough to invite me on their netcast last Monday night, their 199th. If you would like to listen, go to www.weatherbrains.com . 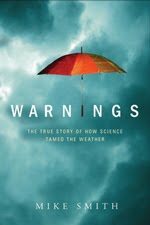 "Warnings" - my new book! Greenleaf Book Group, my publisher, delivered eight prospective covers for "Warnings" Tuesday afernoon. Since then, nearly 200 people have commented on the covers. Kim and I spent most of the day going to bookstores and asking customers and employees which cover they liked. We chose the one you see here and on our website. It will be out May 1, 2010. The publisher is Greenleaf Book Group of Austin. Welcome to my blog. My day job is CEO of WeatherData Services, Inc., which is part of AccuWeather. I founded WDSI in 1981 because of my passion for applying weather science to saving lives and property. 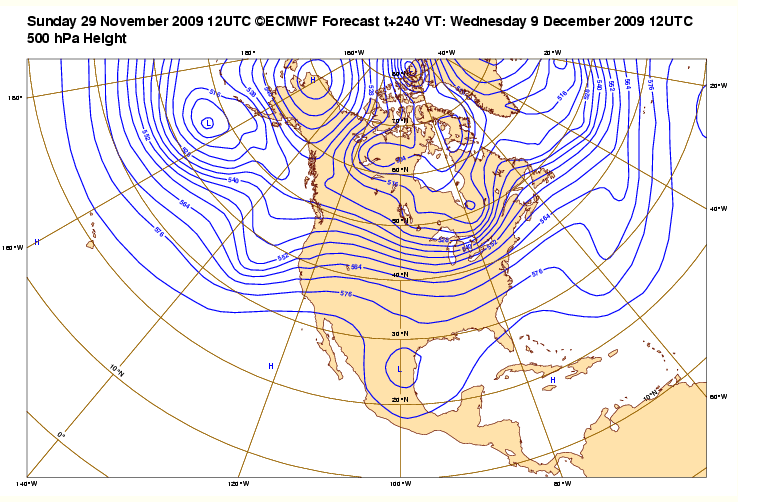 This blog is going to talk about things related to weather science that I hope will be of interest. And, if I think you might be interested, I'll occasionally talk about sports, photography and other topics away from science.